Littelfuse Powr-Gard™ Powr-Pro® CCMR Series Dual-element rejection current-limiting time-delay fuse is rated at 10-Amps and 600-Volt AC, 250-Volt DC. 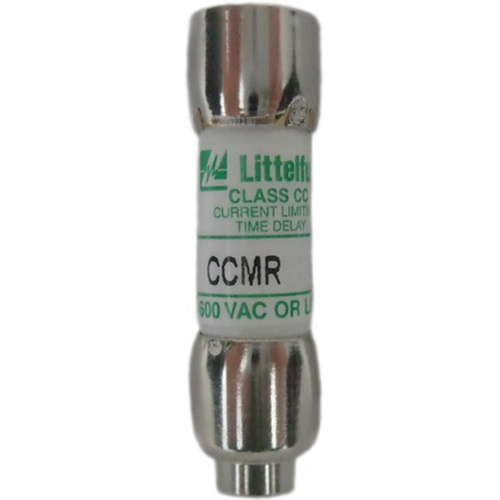 This midget CC class fuse has ferrule terminal connection and cylindrical body style. The interrupt rating of this fuse is 200-Kilo-Amps RMS symmetrical at 600-Volt AC, 20-Kilo-Amps at 250-Volt DC and 300-Kilo-Amps at 600-Volt AC Littelfuse Self-Certified. It has dimensions of 0.41-Inch Dia x 1.5-Inch. The non-indicating fuse with cartridge mounting, is suitable for motor and motor branch-circuit protection. Fuse is UL listed, CSA certified and RoHS compliant.